Adrien Dube is the owner of Word of Mouth Painting. 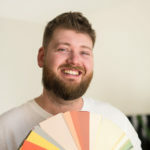 Adrien has been painting for more than a decade and is extremely passionate about the art of painting and restoration. Performing quality work is his number one priority and he always works to ensure your project is finished to his high standards and to yours. Please use the contact details below or fill in the contact form to get in touch with Adrien.